While Tandy/Radio Shack’s business model of developing in-house brands and selling rebranded products from other companies eventually fell out of favour, back in the 1980s it seemed to be a successful strategy. Radcon Wild Fox (Asia/Europe) Original release. None of the “Radio Shack” R/C vehicles you’ve ever heard of were actually manufactured by Radio Shack themselves. Rather, all were made by established R/C toy makers from Asia such as Nikko, Taiyo, Atcomi, Daishin, Radcon and many more. The best of these tended to be the ones that were manufactured in Japan and Singapore, with a few admirable efforts from elsewhere. Sadly, where once it seemed that the quality level of most R/C toys coming out of Japan and Singapore was so high that Radio Shack’s offerings automatically benefited from this reliable supply of products, as the years passed almost all of the high quality manufacturers disappeared, while newer products were being made at cheaper factories in mainland China. Naturally, this new supply also fed into western markets. 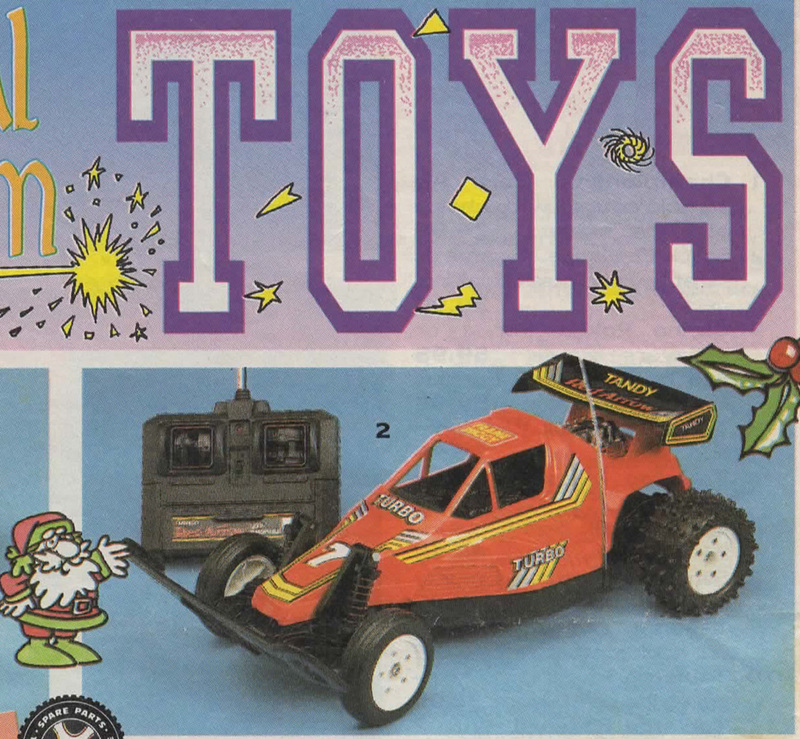 Few toy categories were hit worse by the manufacturing shift to China, than ready-to-run R/C cars. 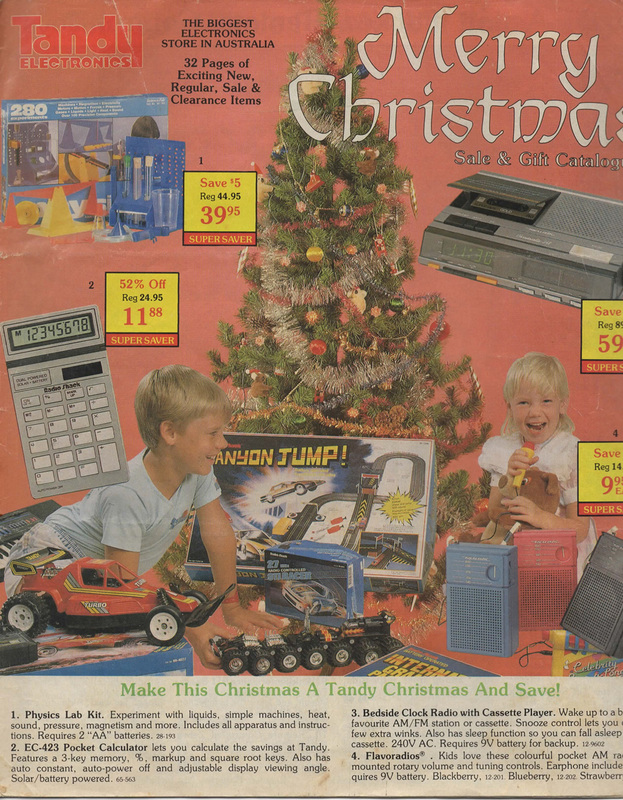 Where once in the 1980s, R/C toys had been a premium item with material quality and performance to justify their price, in the 1990s waning interest from consumers and a seeming oversupply of stock led to a number of good manufacturers going out of business. Couple this with the rise of China as a manufacturing base specializing in ultra-cheap technology items, and it quickly led to R/C cars being manufactured down to a price point (rather than up to any sort of respectable standard). As I write this, you can purchase working R/C cars (made in China) in any shopping mall for as little as $10. Taking inflation into account, the 1980s equivalent of that dollar figure would have been about $4 – yet there was no such thing as a $4 R/C car back in the 1980s. The cheapest, most basic full-function model you could buy back then cost about $40 or more – roughly 10 times dearer. And this shows you how much has changed. 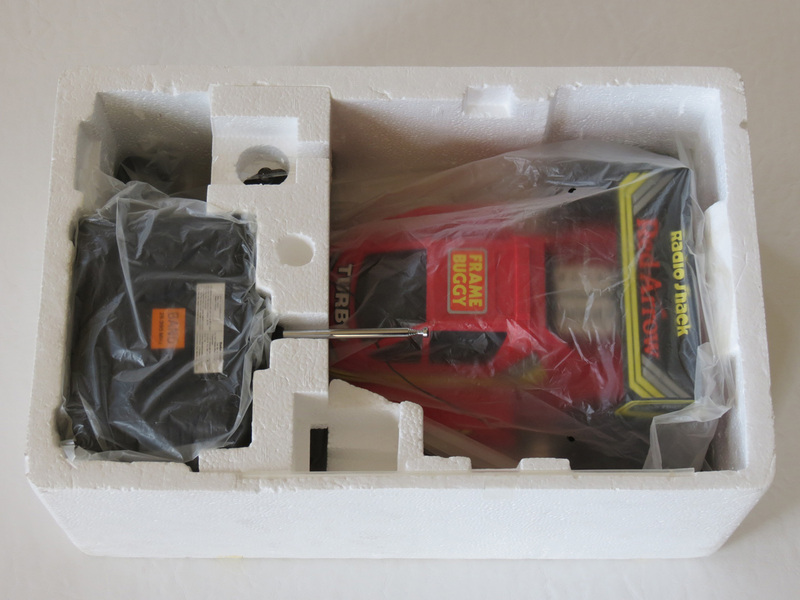 R/C toys today are cheap, throwaway items. Yet in the 1980s, they may have cost a lot more, but they were also a far better standard and were intended to be enjoyed for years. 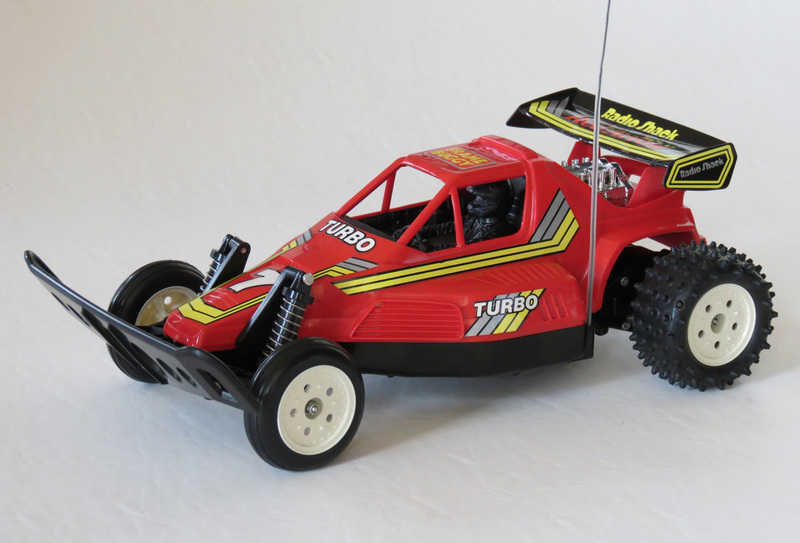 While it certainly wasn’t the cheapest R/C car on the market in it’s day, the Tandy/Radio Shack Red Arrow Buggy epitomized the sorts of things you could get in the late 1980s if you were willing to pay for them. 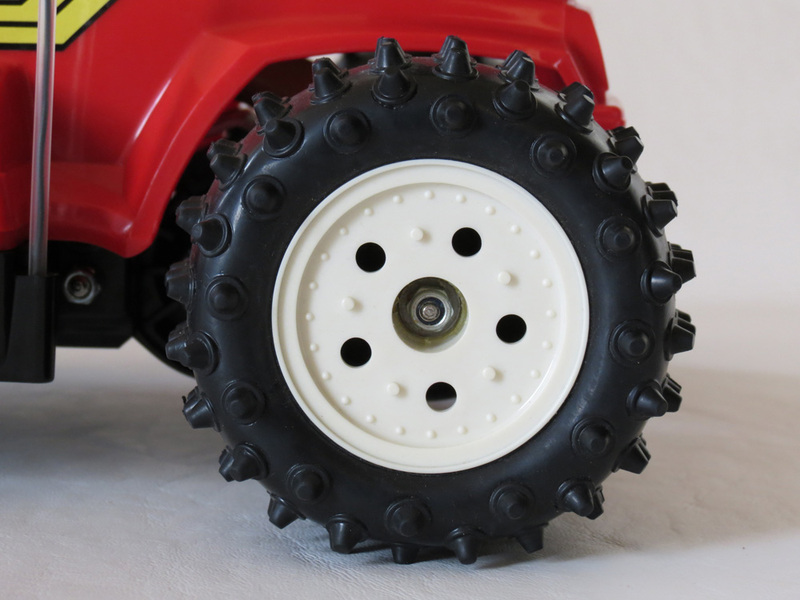 In this case, a 1/10 scale, 540-powered, realistically detailed R/C buggy made from robust plastics and with proper rubber tyres. 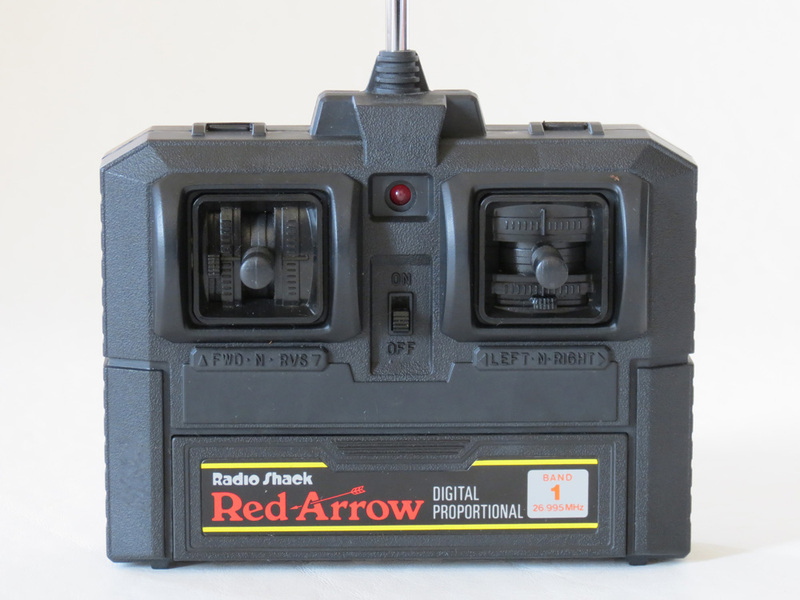 The Red Arrow was added to the Radio Shack range in 1988, having been produced by a Taiwan-based company called Radcon (obviously a portmanteau of “Radio” and “Control”). Radcon had existed since the earlier 1980s and made quite a few R/C cars until the early 1990s when their name changed to Digitcon, before becoming one of the many casualties of the downturn in the R/C market. And despite not being based in Japan or Singapore, this was a company that produced comparable toys that are still leaps and bounds better than a lot of the base-level R/C buggy landfill you’ll find in stores today. 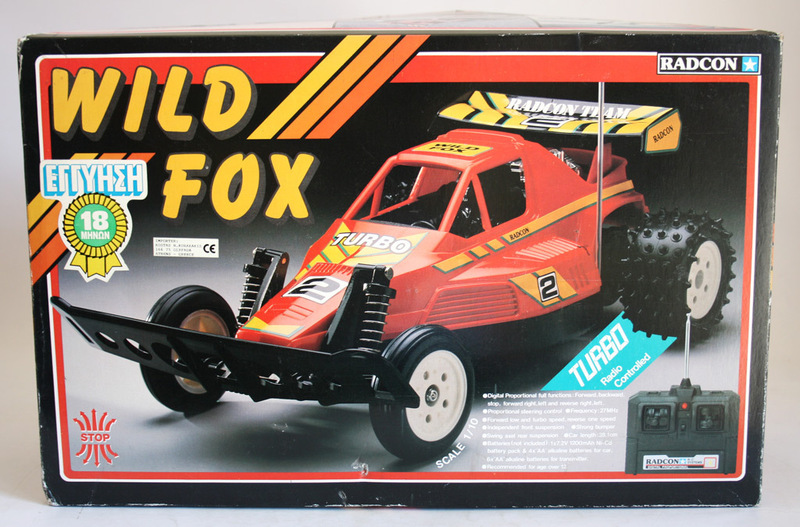 Radcon initially released this car under it’s own branding as the Radcon Wild Fox, but this earlier incarnation only seemed to make it as far as Europe. Once a big US firm like Radio Shack licensed the toy, it became available in retail outlets across the US, Canada, parts of Europe, and Australia, not to mention appearing in colour catalogues and TV commercials. With the name changed to Red Arrow Buggy, this powerful and versatile buggy finally made it’s way into thousands of homes around the world – particular at Christmas time. The name “Red Arrow” had been a great idea. 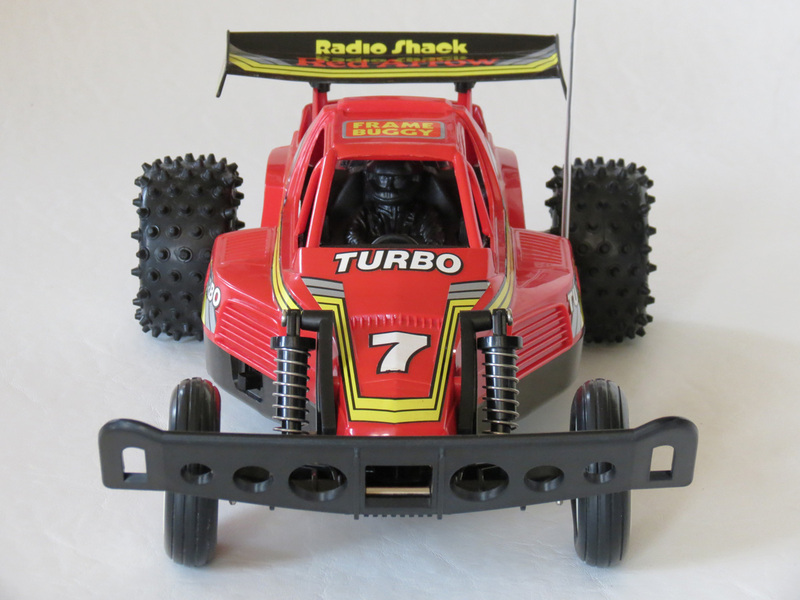 With Nikko already supplying Radio Shack with a top-of-the-line buggy that Radio Shack was calling the Golden Arrow Buggy, having a second model with “Arrow” in the name gave the impression the two were part of a series of top-level R/C toys. By coincidence they even had similar-looking tyres and wheels. But beyond that, they could not have been more different. At this price, the car was obviously quite popular. 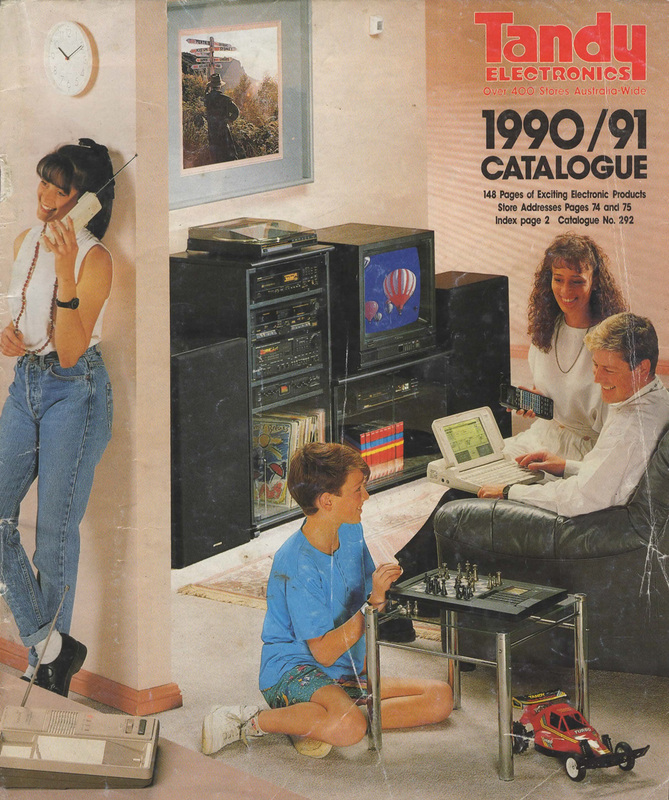 And it was sometime in 1990 that, rather than just admiring the car at Christmas time, I gave it my first actual test drive at a Tandy store near my home. Of course I already knew it was fast, being well aware that it was 540 motor powered buggy. But blasting it around inside a narrow Tandy store, I could barely avoid all the obstacles that in the way. And after a minute or so, I gave it back to the salesman, not wanting to damage anything. And now for a new-in-box example of the Red Arrow itself. Illustrated toy box art wasn’t just the preserve of the master illustrators at Tamiya, after all. Once common practice on toy packaging, Radio Shack was a company that probably kept this tradition going longer than most, adorning many of their 1980s R/C car boxes with truly fun (and now retro) illustrated scenes of the vehicle set against beautiful landscapes or tearing up the terrain as though it were real (often with human figures in the scene). I doubt the artists behind this work got any credit at all, so credit where it’s due – I really love Radio Shack box art illustrations. 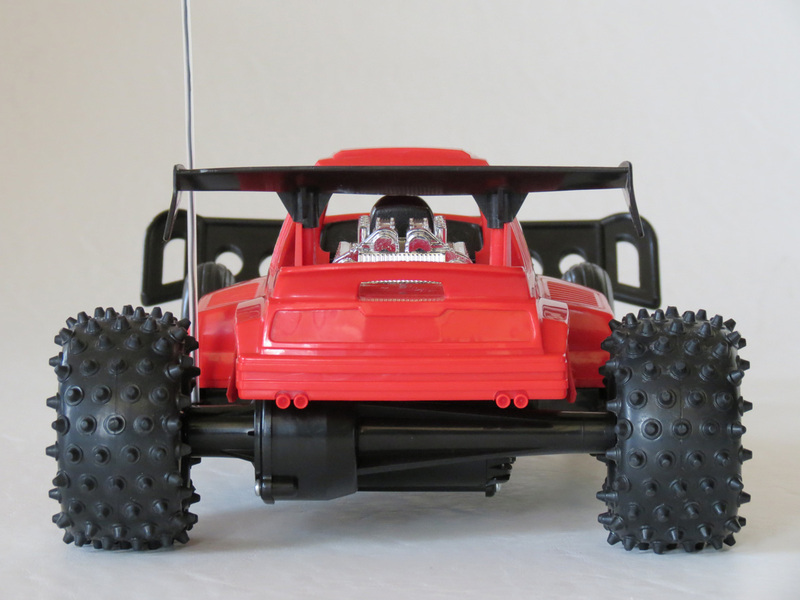 Head for the toughest country back-roads with this rugged buggy racer! Leave the others behind in the dust with instant turbo acceleration! 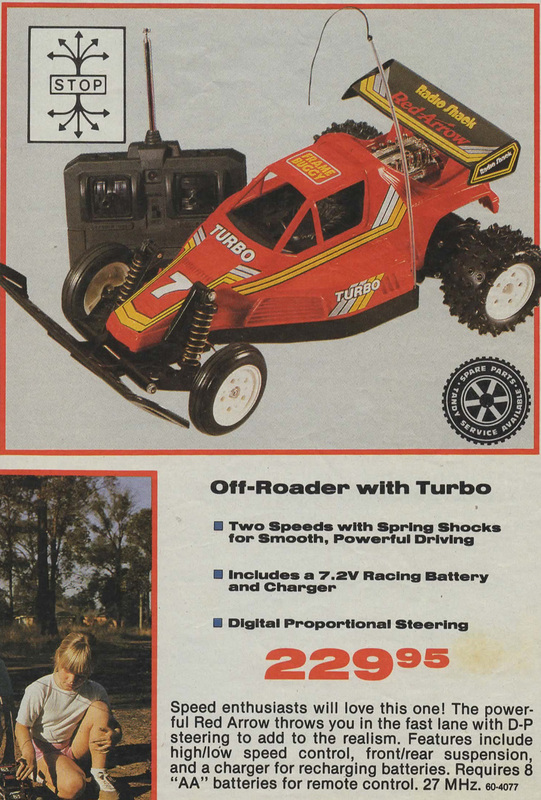 Radio Shack/Tandy were never short of hyperbole for their products (in fact, I can still remember one of their tiniest and least-powerful R/C toys being described with a phrase like “take the lead on the straightaway!”). But in the case of the Red Arrow their enthusiasm was spot-on for the car, as the Red Arrow was more than capable of leaving a trail of dust in it’s wake. 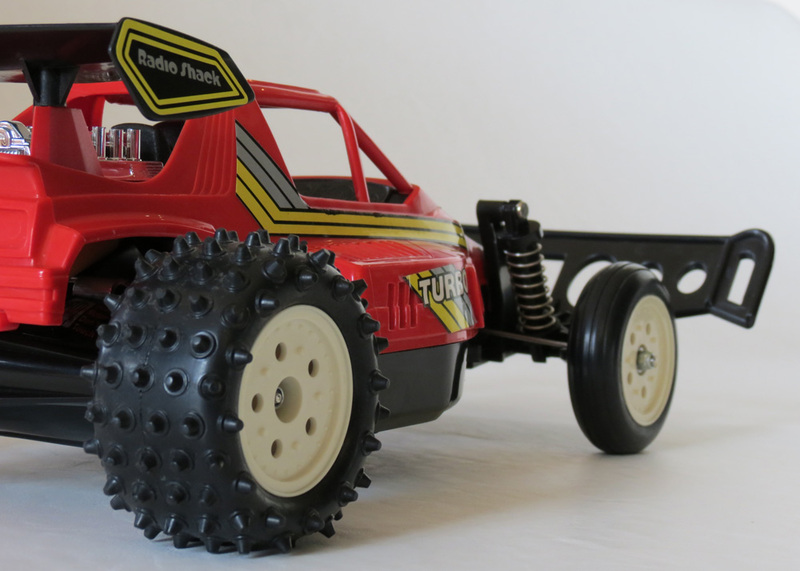 Featuring the familiar combination of fat, spike rear tyres and smooth, ribbed front tyres that had been a de-facto standard among kit-based R/C cars since the early 1980s, the Red Arrow is a somewhat angular and unusual looking car. When you consider it arrived in 1988, by which time all the sleek and spacey “aero” R/C buggies had started to appear on the market, the Red Arrow might have been better placed had it come out in 1985. Given that the Wild Fox/Red Arrow was to be Radcon’s best-ever R/C effort before the company disappeared, I like what they achieved. The body design is quite well-proportioned, and the lines taper sharply to the front-end giving the car a narrow front wheel track. This is of course accentuated greatly by that enormous front bumper – it’s almost as if they made the front wheel track narrow purely to ensure it was tucked away behind the bumper, for complete protection. The bumper is made from hard but flexible plastic (like much of the car), and the feel is of rugged design. And all this hard-yet-rugged, slightly flexible plastic does make sense when you think about. Ready-to-run cars like these did not have the luxury of utilizing ultra-flexible polycarbonate bodies, as those would require painting (thus preventing the car from being ready-to-run right out of the box). So to make up for it, there had to be compromises – like impact-ready rugged plastics, or huge bumpers to protect the entire car. From behind, the car is much wider and squat, with twin “exhausts” but no visible sign of rear suspension due to the body overhang concealing it. Underneath, things get even more interesting – and unique. 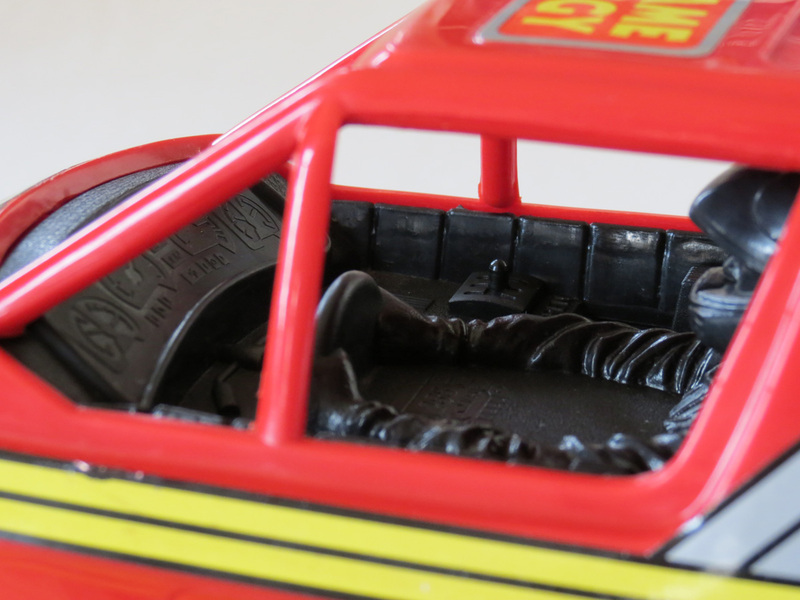 Unlike most ready-to-run R/C cars of the era which tended to require the body to be unscrewed if you needed to fix something, the body of the Red Arrow can be removed via a pair of large sliding levers located on either side of the driver figure. Simply slide them both forward, and the body shell comes free. It’s done this way because the batteries need to be inserted with the body off, rather than via a battery door underneath the car. 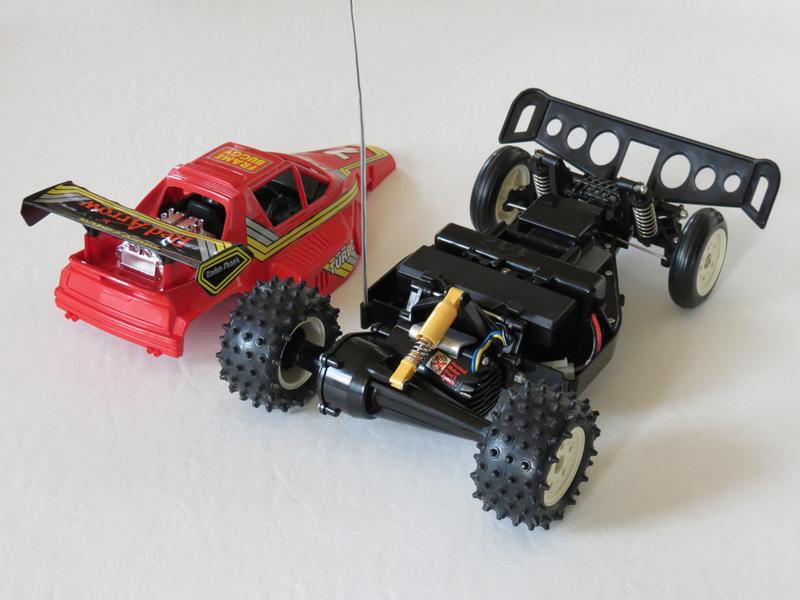 Much like a Tamiya buggy or any other 540-powered buggy of the 1980s, this tried-and-true combination of AA cells (for receiving the radio signal) and 7.2v battery pack enables you to keep control of the car even when the pack runs out. In another interesting twist, the Red Arrow does shed the (inevitable) heat energy of the large battery via ceramic resistors – much like a Tamiya. Except in order to ensure safety, Radcon tucked those resistors under the nose of the car, beneath a cage – ensuring that nobodies fingers would ever get burnt. Suspension is the usual combination of spring/friction dampers with independent travel at the front, and rolling rigid axle at the rear. However, the rear only features a single yellow damper. But it’s sprung stiffly enough to support the rear weight of the car without any problem. 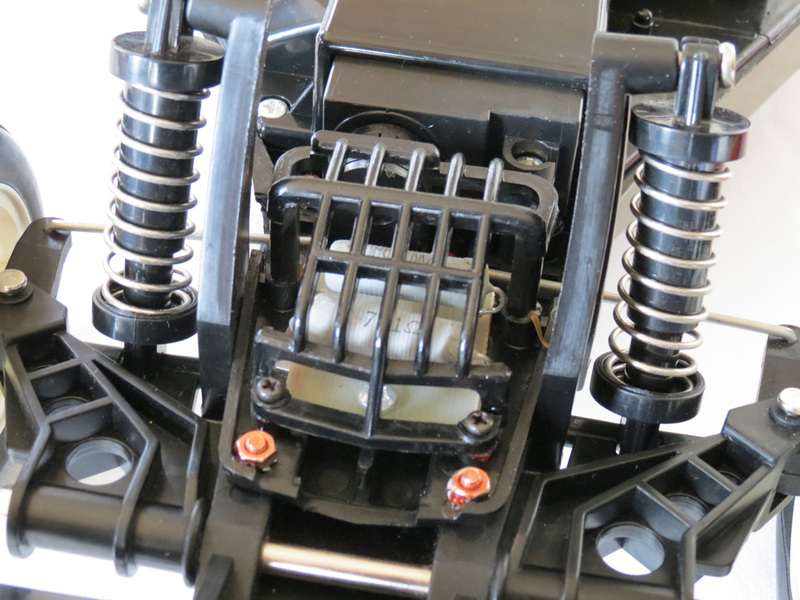 Just the usual bouncing you get from any R/C toy that lacks the full oil dampers found on the more advanced models. The performance of the Red Arrow has been said (by some) over the years to have been quicker than that of the Golden Arrow. Which would be funny if it were true, seeing as it was priced quite a bit cheaper. 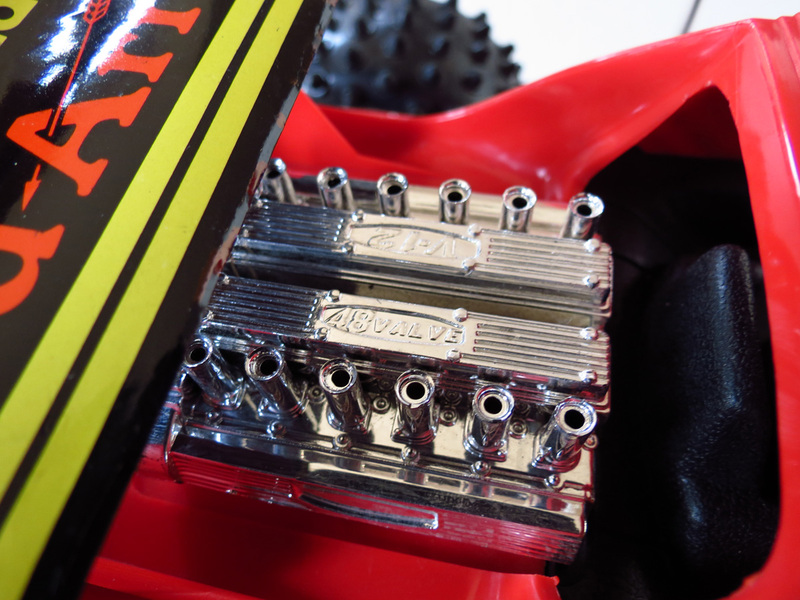 And there’s no reason why it might not be true – if the weight and drivetrain are somehow better, perhaps the Red Arrow made more efficient use of it’s Mabuchi 540 powertrain? Personally I’ve never raced both “Arrows” at once, so I am not sure which was truly the fastest. I always found them to be quite similar in acceleration. And that alone was enough to make this buggy a bargain, offering similar performance at up to $100 less than it’s “Golden” sibling. I doubt either of them were faster than a Tamiya Hornet or Tamiya Frog, but they were certainly close at times. Please share your thoughts in the comments area if you have any interesting stories to tell, as it’s always great to hear about those childhood races along streets and in backyards. Radio reception from the included Digital Proportional transmitter was typically quite good, and a cut above any ready-to-run R/C toy in a lower price bracket by offering a greater range. 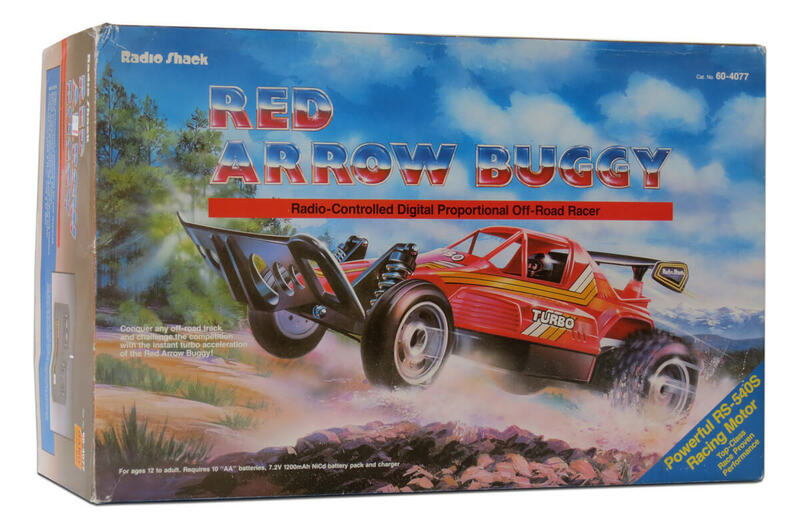 Overall, I always found the Red Arrow to be a very solid, reliable all-round off-road buggy with some cracking speed that was in excess of both a few of the low-end Tamiya buggies (like the Grasshopper), as well as the smaller, nimble upstarts like the Jet Hopper et al. 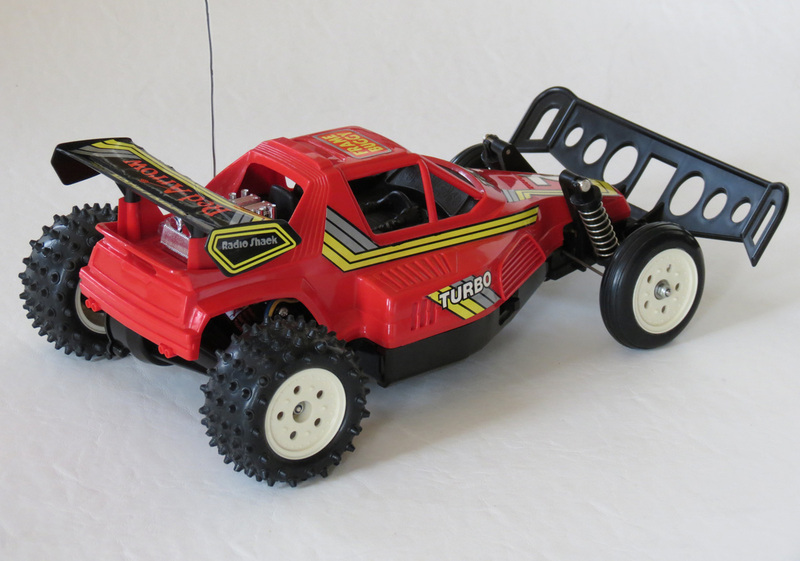 A typical 2WD racer, it was prone to “fishtail” on loose surfaces, but that was all part of the fun of 2WD R/C back in the 80s, and it was probably a little easier to drive in some ways, than the likes of a Tamiya Hornet. Of course, anything with a 540 motor had cracking speed back in those halcyon days of the 1980s. 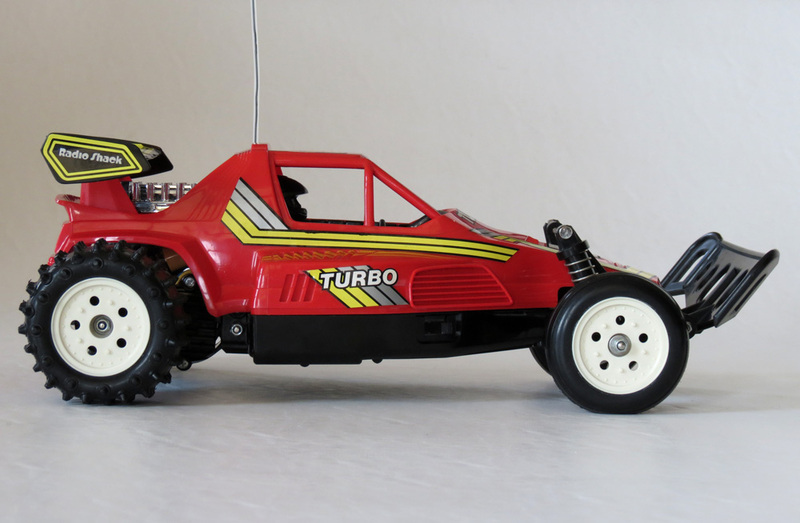 But as was often the case with mid-1980s R/C buggies, the Red Arrow combined raw 540 power with a truly unique and interesting body shape, rugged and practical design detail and flair, and some funky 1980s action box art. Put all those ingredients together, and you have another bona fide classic R/C buggy of the era. Today, examples of the Red Arrow are reasonably easy to find on the collector’s market, with 2 or 3 usually being offered for sale at any given time. Of course, most of those examples are used, so mint-in-box ones are a lot harder to locate. Such is the problem with all ready-to-run R/C toys, they were just all too easy to take out of the box and play with back in the day. So 99% of them are in used condition today. 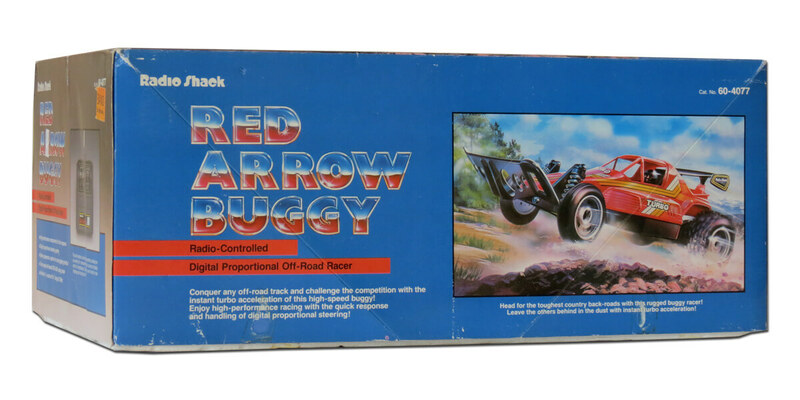 But as someone who grew up obsessing over the range of R/C cars and buggies at my local Tandy stores, the Red Arrow was certainly the stuff of dreams for me. So if you had one at the time – consider yourself very lucky indeed! I know I feel honoured to have one of the very few pristine examples now left. The Tandy / Radio Shack Red Arrow is relatively easy to find, but extremely hard to find in mint condition. Coming ready-to-run out of the box means most examples are well used. In addition, while this is a fairly rugged model overall, you should check any used examples of this car for damage to the cockpit frame of this model as it has proven somewhat vulnerable to impacts and may be broken. Cockpit frame – the pillar supports around the windscreen may have damage if the model has been flipped, on used examples. Great overview of the Red Arrow! Wow that was a lot of money when you stacked it up against the Jet Hopper which also had 2 speeds and spring shocks and knobby tyres. Very true Nidan. The main point of difference I guess is that the Red Arrow is physically quite a bit larger (1/10 scale, versus 1/16 for the Jet Hopper), and typically any 540 motor powered buggy of the 1980s was a premium item capable of up to or in excess of about 30km/h. While the Jet Hopper was capable of 23km/h (for the mk1 type), 25km/h (for the mk2 type) and 27km/h (for the mk3 type). Still, you are right – the Jet Hopper offered a lot of fun (and speed) for just under AU$100 back in the 1980s. I guess you could argue that the Red Arrow is closer to hobby grade compared to the toy grade jet hopper. Apart from the fact that it was mass produced it was closer to an entry level Tamiya in many ways, possibly even superior, it had a bigger motor than a Grasshopper and the trailing arm front suspension doesn’t change camber like a Grasshopper or Hornet. And even with two gears the Jet hopper doesn’t have as much speed as a Red Arrow and it’s acceleration doesn’t compare, the Red Arrow has bags more torque, can reach it’s top speed much more quickly and can accelerate hard and maintain more speed off road and on gradients. The Red Arrow handles better thanks to its differential and benefits from proportional controls too. I love the Jet Hopper, it was a bargain and the top speed was impressive compared to most other toy grades but the Red Arrows higher price tag is justified. Another fantastic article 🙂 I too remember ogling this and the GA at my local rural Tandy store. One thing here confuses me though, there’s mention of 2 speeds – is this a selectable 2spd gearbox like many other RS/Metro/Tyco etc vehicles, or did it have a “Turbo” function ala Hopper series? Or just propo throttle and misguiding adverts?! Cheers Dave. And yes, well spotted – the print advertising for the Red Arrow often mentioned “2 speed” and “turbo” – yet this was all incorrect 🙂 Probably a case of the editing staff just getting it wrong… The Red Arrow had, as you said, a proportional throttle – which was simply very fast at top speed. But there was no 2-step forward lever with “turbo” function (as see on many Taiyo and Nikko models), nor was there a switch selectable gearbox with low/high or anything like that. I actually had the gearbox apart on mine recently and discovered a couple of interesting parts including one part that had an H and a L clearly marked out almost like it related to a gear selector. Perhaps at one point a dual speed box was consideredbut abandoned? thank you for an awesome blog! look forward to reading future posts! I had a Red Arrow which I just about managed to save up to buy, but didn’t have the funds for a 7.2v battery pack! 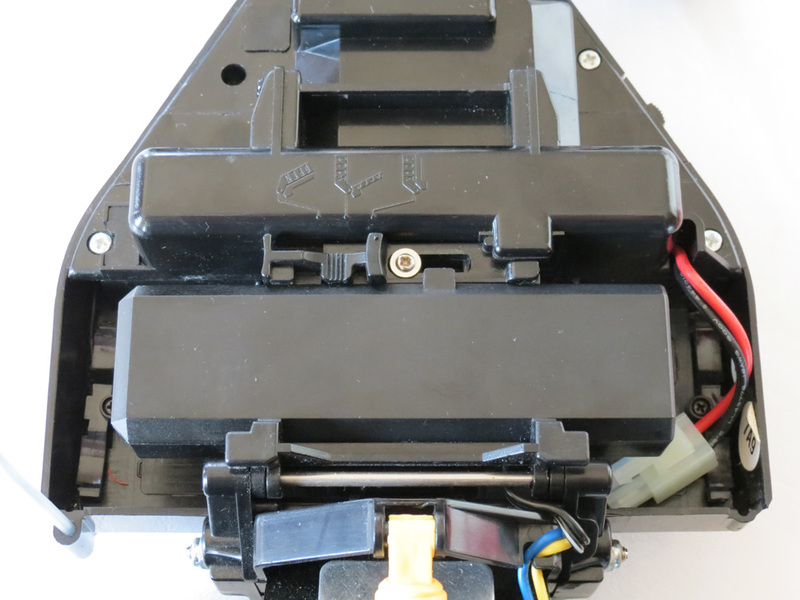 So I chopped a normal battery holder (also from Tandy for some electronics tinkering) in half and stuck the bits at each end of the battery compartment to run it on some spare Ni-Cd batteries I already had spare. For some reason, in the end rather than save up for the battery pack, I swapped the whole lot with someone at school for an auto-reverse personal stereo! He was delighted with the car, I was delighted with the tape player. Really enjoyed your writeup and detailed pics of your perfect RED ARROW example. Brings back a strong feeling of nostalgia. I too drooled over the RC model lineup at Radio Shack here in Canada, especially around Christmastime! My friend next door received this model at Christmas, was ’88 OR ’89. I had never seen any toy run so fast! He had a large room inside with a hard floor, and the rear tires were just getting roasted! Once the snow disappeared, it was a dirt driveway superstar! I would have loved to have owned one, but it never did happen…perhaps I can find one sometime. If not, your truly excellent writeups on all the ’80s RC goodness will suffice! 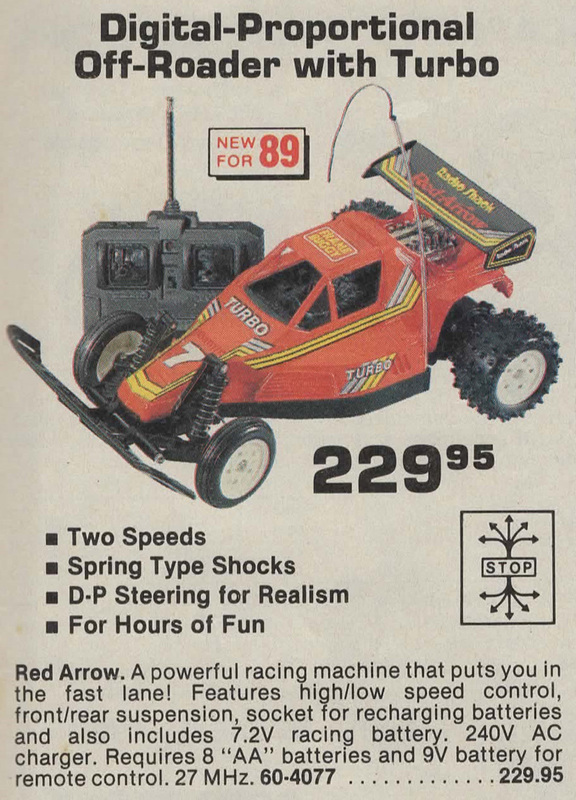 Yes, the Red Arrow, being 540 motor powered, was likely to impress any kid and his friends back in 1988. Great times, and great memories. I lived in a block of units when they first came out. Their were four of us that had a r/c car , it was real fun at the time. My observations at the time were the hornet was a tiny amount quicker than the others but not by much. The golden arrow was stronger in an accident with walls and other cars. I thought the red arrow was a tiny bit slower, but may have been that particular car. The Hornet steered slightly better than the others. I have just pulled out of a packing box a couple of hornets, two golden arrows and a red arrow some going and some not. One of the golden arrows at the time stopped working so I frankeinstined hornet running gear into it. That one works perfectly. Great well written article thank you. That all sounds about right Danny, thanks for sharing. The Radio Shack buggies’ steering may also have been a tad less responsive than the kit radio the Hornet was likely using. Great to hear from someone with some comparison memories of them… most of us were lucky to know anyone who owned one of these case, so it was hard to compare one with another. Cheers for the compliments also. 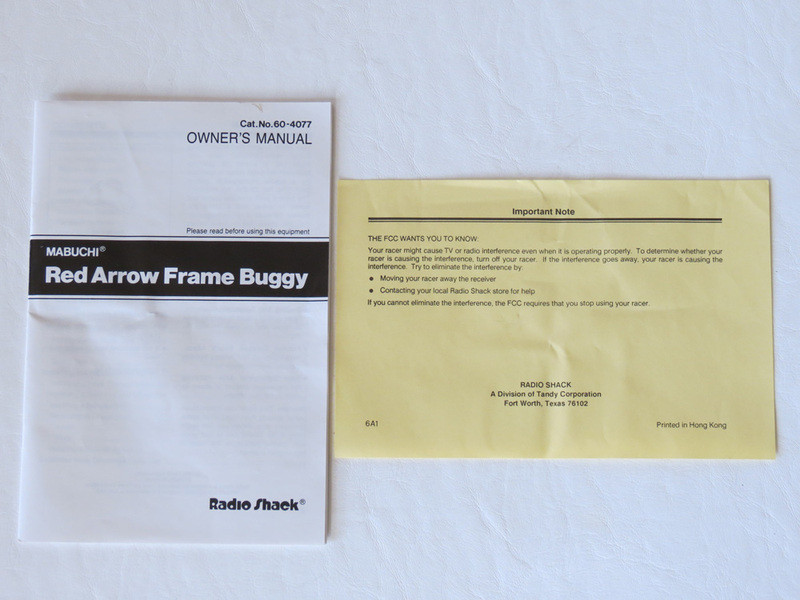 Is there a diagram of transmitter interior for Tandy Red Arrow Buggy ? Only goes in reverse and transmitter sounds like something is rattling loose inside. I have no experience, but car ran well previously. It is more likely that the fault is in the car than in the transmitter. If one of the relays (car board) is damaged, the car only runs fordward or reverse.